Well-known and until now non-decrypted sign from Francysk Skaryna’s portrait famous “triangle”, is interpreted here as a Tau-cross linked with Western Christianism and symbolic legacy of the Order of Friars Minor in particular. 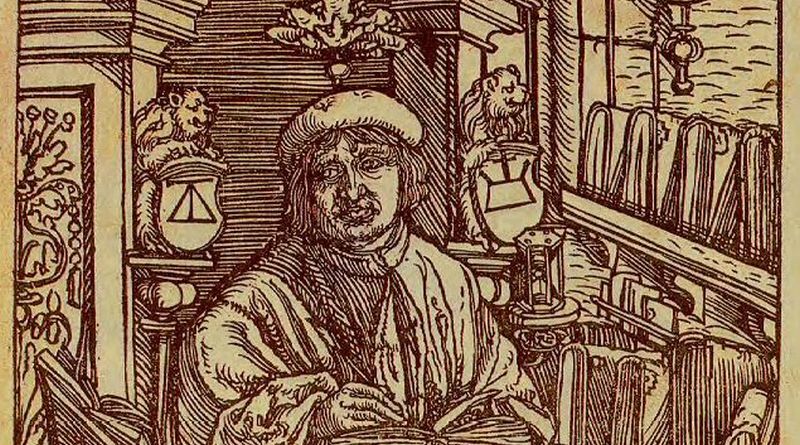 In the Ruthenian Bible published by Francysk Skaryna in Prague in 1517–1519, there was an engraved portrait of the publisher issued twice, framed on the left and right sides by two lions. These lions were holding herald shields with two signs of triangular and quadrangular shapes. The semantic meaning of those signs / symbols, despite all scholarly efforts, has not been disclosed until now. The article offers a new interpretation of the triangle, which is to be understood as the Tau cross inscribed in the triangle, known as a church symbol in the West European tradition. Finally, it is demonstrated that there is a clear although indirect connection of this triangle sign to both Skaryna’s first name and the symbolic legacy of the Order of Friars Minor (Franciscans). Sergejus Temčinas (also Sergey Temchin) Habil. Doctor in Humanities (2001), Professor (2003), a principal researcher and Head of the Research Centre of Written Heritage at the Institute of Lithuanian language (Vilnius). Academician of the Classe di Slavistica of the Accademia Ambrosiana, Milan, Italy (2014). Author of numerous publications in the field of Old Church Slavonic Studies, hymnography, Judaeoslavica, and Francysk Skaryna Studies.